Nail depth is considered to be the number one cause of the poor lifespan related to asphalt shingles. While air powered nail guns can certainly speed up the installation process, it is almost impossible to get the correct nail depth when shooting nails or staples into shingles. This problem is magnified with increasingly steep roof pitches on larger homes (especially in coastal applications) using heavy weight shingles. Whats the solution? Hand Nailing. To provide the quality customers expect from an elite roofing contractor, we offer hand nailing on all shingles on roofs with a slope of 7/12 or greater. Hand nailing ensures proper nail depth so that your new shingles are not damaged. 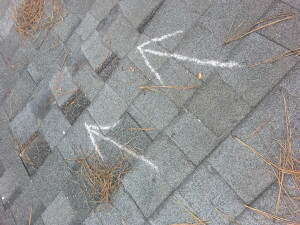 This is one of the many reasons Sands Enterprises should be your choice for quality roofing that will last a lifetime. Contact Sands Enterprises for Any of Your Roofing Questions. We Provide Quality Roof Installation, Damage Repair, and Restoration.